I have a brown thumb. This has been well demonstrated to me by numerous crunchy brown houseplants. Any plant under my control generally looks vibrant and happy for a few months, and then suddenly dies. Then I give up on plants. I tend to forget about my ineptness if I haven’t had to care for a plant for a while. I plant new plants, they look robust and bloom wildly, I start to tentatively think I’m actually not that bad at this after all. Then my plants get sick and die. The cycle begins anew. A few weeks back, Lidl had a special on strawberry plants of four different varieties, in packs of 6. The plants looked healthy enough, too. Tempted by this, TheHighPriest and I thought it would be nice to have our own strawberry plants and a good selection of fresh herbs. Maybe we could learn from past experiences, and be successful this time? I’d tried to grow strawberries in our garden when we lived in the UK. This adventure resulted in a slimy horde of obese slugs, and some vaguely green strings coming out of the ground roughly in the spots where I’d planted the strawberries. 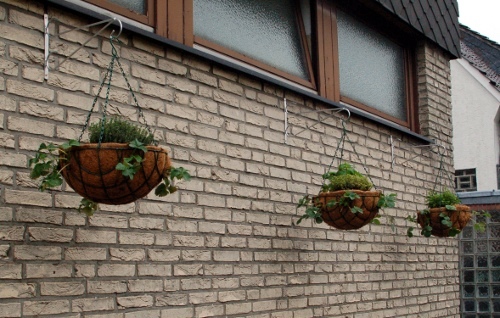 This time, we’d try something a little different to outsmart those squishy beasts: hanging baskets. We picked the perfect spot: under the windows of the toilet block, on the south side of the building. 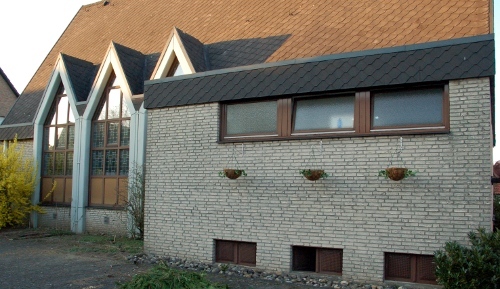 There are three windows there, and we decided to have three baskets (in keeping with the trinity theme we have going around here). I picked three strawberry varieties: early fruiting Elvira, continuously cropping Korona, and late fruiting Ostara. After rummaging through the balls of string, crockery, soap, ceramic meerkats, flower vases, a singing mechanical fuzzy crocodile, assorted “deco” items, and other strange crap at our local Restposten shop, we found their last three large wire hanging baskets and coconut fiber liners. Hornbach (a Home Depot-like home improvement store) supplied silver colored brackets. We were good to go. 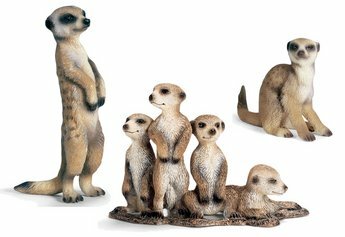 Ceramic garden meerkats. I don't understand it either. The singing crocodile was kinda cute, and I admit, I was a little tempted. Someone else snatched him up, though. A little while later, I added some common thyme to the Elvira basket, crowned the Korona with yellow-variegated lemon thyme and lemon balm (Zitronenmelisse), and opted for oregano in the Ostara basket. I planted borage seeds around the herbs in each basket, since borage is supposed to be a good companion plant for strawberries, and it’s a popular herb in traditional German cooking. There’s still plenty of room in the baskets, so I’m staring purple opal basil, regular green basil, and summer savory from seed, and will add that later when the weather is more reliably warm. I’m also considering adding some rose-scented geraniums to the mix if there’s space. Baskets with some herbs added. The strawberries are already showing signs of being under my care. Unfortunately, yesterday I noticed that I’m at that phase where my happy looking plants are starting to look a little less happy. There are brown splotches on the mature leaves of the strawberries, particularly the left and right ones (Elvira and Ostara, if it makes any difference). I have no idea if this is from overwatering, or cold, or wind, or an infection, or what. 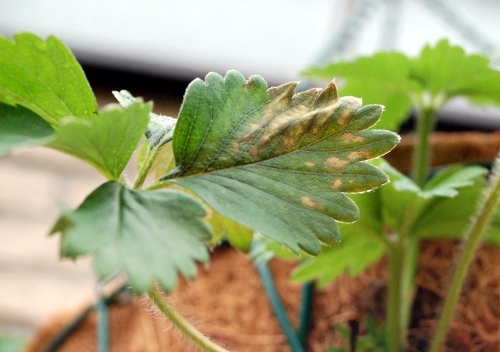 This pdf on strawberry leaf diseases hints that it might be leaf scorch, a fungal disease. The descriptions in this strawberry disease pdf focus mention a purple color to the spots of scorch. The spots on my leaves are brown, so I’m confused. I had the impression that fungal diseases infect plants that don’t have enough circulation around the leaves, something that absolutely cannot be said about these particular plants. So, in the end, I don’t know what’s wrong with them, nor what to do. Does anyone out there? 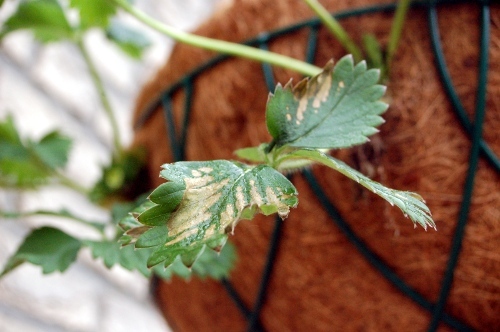 Sick leaf on the Elvira strawberries. Another brown splotched leaf on an Elvira strawberry. 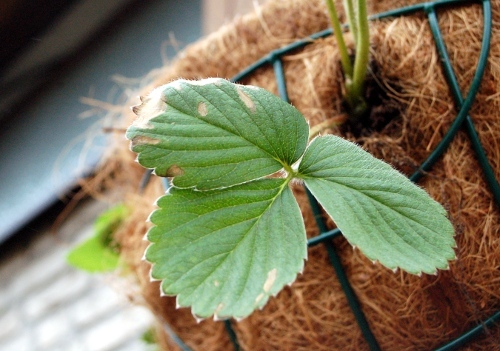 A sick leaf on an Ostara strawberry plant. 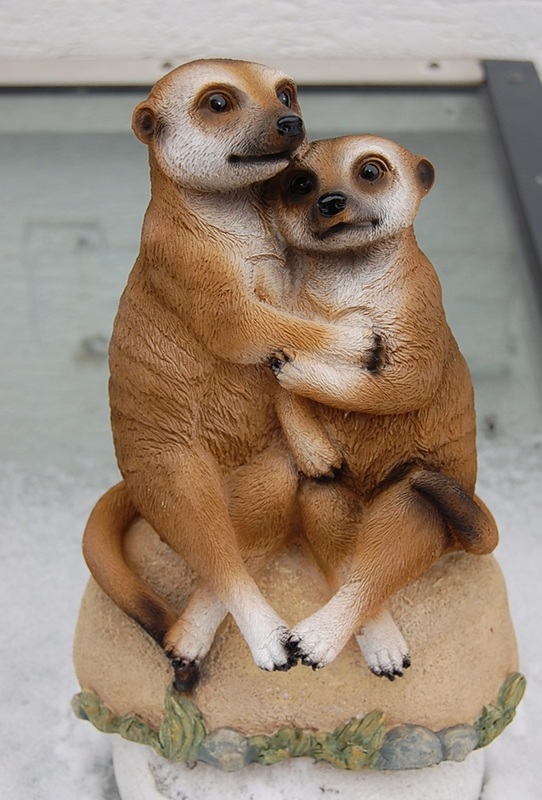 To finish on an elegant note, I leave you with another picture of ceramic meerkats. These things creep me out.